How to Write a Pharmacy Progress Note ? When to Write ? Procedure ? Hello readers. 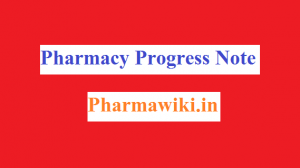 Today here we discuss about What is a Pharmacy Progress Note ? How to Write a Pharmacy Progress Note ? When to Write Pharmacy Progress Note ? Pharmacy Progress Note Procedure. 2 What is a Pharmacy Progress note? 3 When to write a progress note? 4 How to write a pharmacy progress note? What is a Pharmacy Progress note? When to write a progress note? There are 3 main ways to communicate with other members of the medical team. Not all communication is apt for a progress note. According to the urgency of the case, the communication types are chosen. How to write a pharmacy progress note? Write to the point being brief– No one wants to read a long note with mostly ‘fluff’ in it. Physicians haveto read each note. If you can express what is needed in a single sentence, do it. If you suggest a pneumococcal vaccine, in the middle of a 3-page note the physician doesn’t read it, and the patient goes on to develop pneumonia. A physician’s mind is being sued when they are reading a lengthy progress note. Use non-judgmental language– It is easy to be misinterpreted because you can’t use body-language or intonation to show that you are genuinely trying to help take better care of a patient, so make sure you avoid using judgmental language, such as the word “obviously” or the phrase “should have”. Use non-judgmental words like “consider”, “suppose” with your recommendation. The Title-Introduction reveals the basic questions “Who am I? My purpose? Who is/are the patient? Their needs”. Text must support your clear and complete recommendations with subjective & objective information. It should be followed by your signature and how you can be reached. Decide prudently when to communicate verbally, or with a sticky note or a progress note. It can cost a patient’s life. Hope you got the answers for What is a Pharmacy Progress Note ? How to Write a Pharmacy Progress Note ? When to Write Pharmacy Progress Note ? Pharmacy Progress Note Procedure ? August 8, 2018 Avinash Kodoori Articles , Careers , Resources , Uncategorized Comments Off on How to Write a Pharmacy Progress Note ? When to Write ? Procedure ?